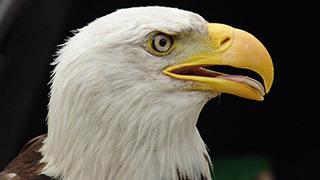 Eagles are a family of 60 species of large birds, they're all birds of prey. The largest species can have a wingspan of over 2 meters, giving them a solid position at the top of the food chain in the avian world. Some of the species capture mostly fish, others capture other birds and the largest can even capture mammals of 30 kilograms.